We were among 44 fans targeted by police and held for hours. We are seeking justice. We're a group of 44 football supporters issued with dispersal notices by the police. We went from trying to watch a game to being detained for four hours. We're launching a legal challenge to ensure that this unjustified use of dispersal powers is stopped. This is happening across the Country time and time again. Supporters being turned into criminals. Please contribute what you can and share this page on social media, with fellow friends, family and fans. We as a group have travelled to many games and in fact on group holidays and to date there have never been any issues - yet the police can disperse us without having to give us full and frank answers - this cannot be right. On 17th March 2015, officers from various police forces were involved in issuing a group of approximately 50 football supporters with dispersal notices pursuant to Section 34 and Section 35 Anti-Social Behaviour, Crime and Policing Act 2014 (“the 2014 Act”). The crime - no one knows - the police are relying on ‘Public Interest Immunity’ which allows the none disclosure of information and intelligence! Basically, the police do not have to justify their actions and can hide behind this immunity to abuse powers against innocent football fans. If you love football you are vulnerable to being treated this way. 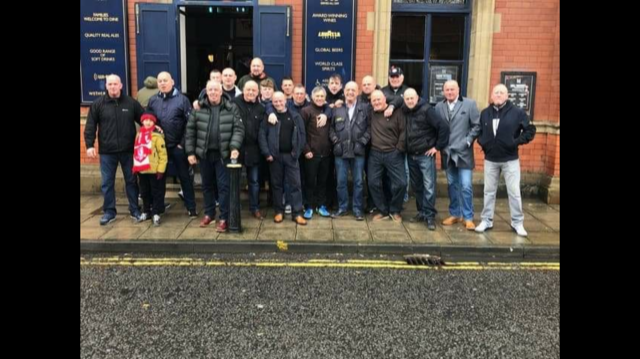 Middlesbrough football fans, who had travelled to a Derby away game, lost their liberty for over 4 hours, during which time with most were not allowed refreshments or to use a toilet (half of the group had to urinate in the street next to a church where the police had cordoned the group like cattle in a pen and the other half were left waiting in pain to relieve themselves). Many of the group had taken time off work, purchased tickets and were all looking forward to the game. Instead they were deprived of their liberty and escorted out of the City by an unprecedented number of police officers. The group were escorted through the streets of Derby to the train station, then escorted to Nottingham to be detained even further until transport arrived, then escorted on the outside lane of the M1 at 50 mph surrounded by squad cars with blue lights and sirens. It has been described as one of the most humiliating experiences of the fans entire time supporting Middlesbrough FC in over 40 yrs. The use of such powers should ONLY be used to disperse INDIVIDUALS for a period which may be necessary for the purpose of removing or reducing the likelihood of either (a) members of the public in the locality being harassed, alarmed, or distressed; or (b) the occurrence in the locality of crime or disorder. When deciding to make such an authorisation an officer must have particular regard to the rights and freedoms of expression and assembly in articles 10 and 11 ECHR. In many cases there is no individual assessment of individuals - the police are seemingly able just to cherry pick a ‘group’ and disperse everyone without having to offer any reasoned explanation. Our legal team is working on a no win no fee basis but going up against the police means we could be forced to pay their costs. None of us can afford that kind of money. Firstly we are raising £10,000 but we then need to go on and raise the full £60,000 in order to cover our costs. Unless this power is challenged the police will continue to deprive others of their Human Rights by falsely detaining fans and taking away their right to enjoy a football game. BY DONATING EVEN JUST £1 or sharing the page you could help with legal costs to put right this wrong. Please note if we win this case all funds raised will be donated to other justified causes, this has nothing to do with money, it's about justice for Middlesbrough fans and fans across the Country. Please share, please support us, please help us put right this wrong. I'm a respectable 73 year old and I'm tired of being treated like a second class citizen when I go to a football match I'll support anything which helps to change this.